After New York, Milan was the center of the fashion world for a week. 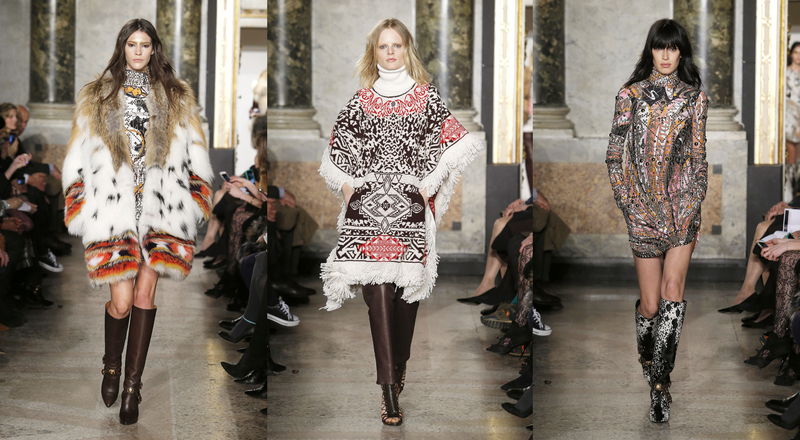 Fendi and Emilio Pucci unveiled their always eagerly awaited collections for Fall/Winter 2014-15. Futuristic camera-mounted drones filmed the action, as Fendi models took to the runway to showcase the latest collection at its fierce and sophisticated finest. The Fall-Winter 2014/2015 collection fused urban chick, military edginess, and a special accent on furs, highlighted in a number of looks. From small patches on dresses to stunning hoods and luxurious fur coats with Fendi’s trademark length-alternating patterns, the collection was primarily dominated by black, brown and khaki green. Wearing a black coat with a gargantuan fur hood, completed by white boots and gloves, Cara Delevingne opened the show, filming the runway from a camera hidden in Fendi’s latest accessory bound for popularity, the Karl bag bug. Lagerfeld’s fuzzy mini-me comes with dark sunglasses, ponytail, tie and a pink fur mohawk. Peter Dundas signed a prodigiously successful collection for Pucci, replete with references to the history of the House and his own story. This return to sources melded south and north, as the deep roots of Pucci’s native Florence met the designer’s Norwegian origins. The materials selected subtly evoked this never-ending voyage: oversize fringed knit sweaters followed light printed and re-embroidered dresses. Milky leathers used on wide leg pants introduced a more rocker touch, perfectly reconnecting with Pucci’s stylistic vocabulary.